A while back, we received (but didn't post for some strange reason) a two-song demo for this band. We didn't know much from that release (it didn't have a j-card, of course). But now, thanks to Casey Lewis, we have a full tape from these guys. Clayton Hayes went on to start up the Gigposters.com... and that's all we can pull together right now. Get the full length tape here, while we go try to figure out what happened to that other tape. 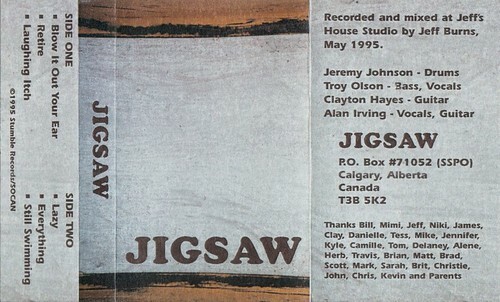 Al Irving played in Nine Miles to Morgan after this, and the drummer on this tape, Jeremy, formed Donnybrook a few years after Jigsaw. Another Bowness HS band. memories!